you move and edit the regions in a Mathcad worksheet, they may end up overlapping one another. Overlapping regions don’t interfere with each other’s calculations, but they do make worksheets hard to read. A good way to determine whether regions overlap is to choose Regions from the View menu. 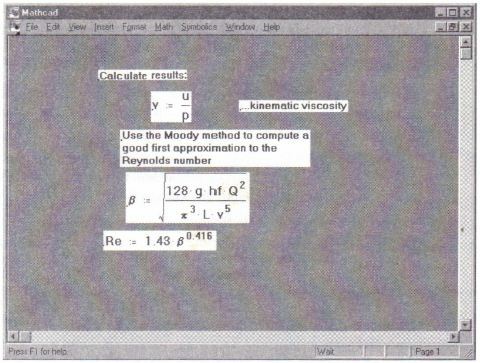 Mathcad will display blank space in gray and leave the regions in white. 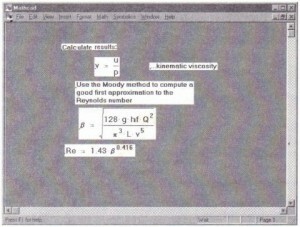 Figure 3-3 shows an example. To separate all overlapping regions, choose Separate Regions from the Format menu. Wherever regions overlap, this command will move the regions in such a way as to avoid overlaps while preserving the order of the calculations. Be careful with the Separate Regions menu command since not only can it have far-reaching effects, it also cannot be undone. 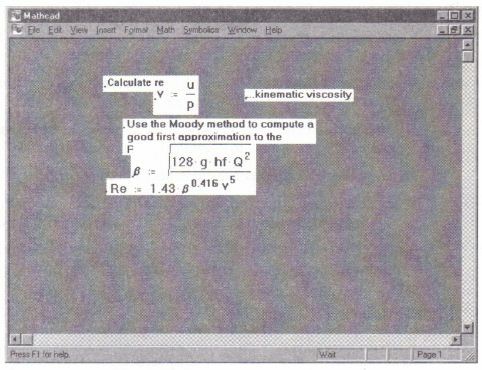 As an alternative, consider dragging regions individually, adding lines by pressing [Insert], or cutting and pasting the equations so they don’t overlap. Figure 3-4 shows the worksheet from Figure 3-3 after having chosen Separate Regions from the Format menu. To turn the blank space back into white, choose Regions from the View menu again. Figure 3-3: Worksheet with overlapping regions . Figure 3-4: After separating the regions.